I made this cake for my daughter’s birthday at her request. Actually, she asked for a strawberry cake so I was unsure whether she meant a cake with strawberries or a strawberry flavored cake. I went with the cake with strawberries. I hunted around for a recipe and found this recipe posted by BecR on Food.com . It is fabulous. It’s an easy cake to make and it looks like you were working all day. I made the cake layers from a box but you can make homemade or buy the layers in a bakery. In the second not-very-good picture, I just wanted you to be able to see where exactly to put the strawberries. I should never be allowed to cut cakes or pies, LOL! Make or purchase the white cake layers and allow to completely cool if baking. Mix the strawberries with the sugar in a medium bowl and set aside at room temp for about 30 or so minutes. Put aside a few strawberries for garnish if you so desire. Using a mixer on medium, whip the cream cheese and powdered sugar and vanilla until creamy, about 2 minutes. Beat in the cream until it starts to thicken, then increase to high and beat until soft peaks form. Do not over mix. To assemble the cake: Place one layer on serving plated and layer half of the sweetened strawberries over the top and press gently. 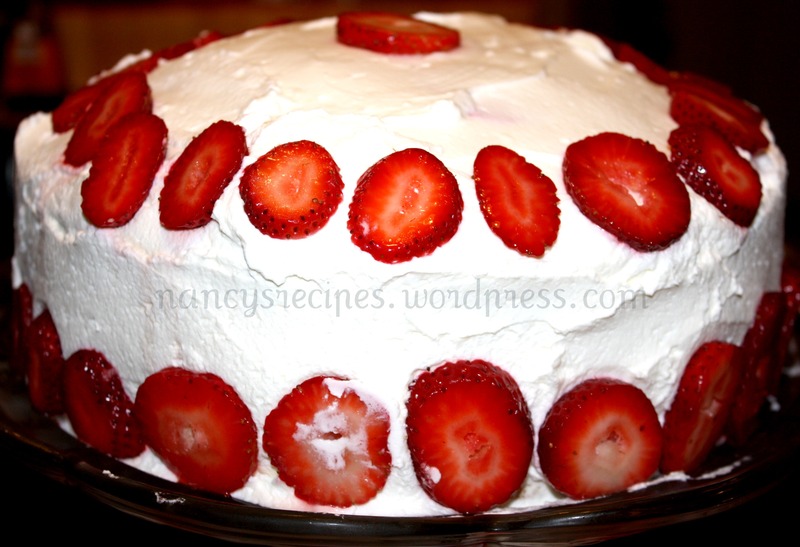 Spread about 1/3 of the frosting CAREFULLY over the strawberries to within about 1/2 inch of the sides. Place the second layer on top and press down gently. Do the same with the strawberries. Frost the sides and top of the cake. This is such a delicious dessert and I made it as low sugar as I possibly could so I could have a piece. I don’t think I would use the full sugar next time ~ it’s perfect without. 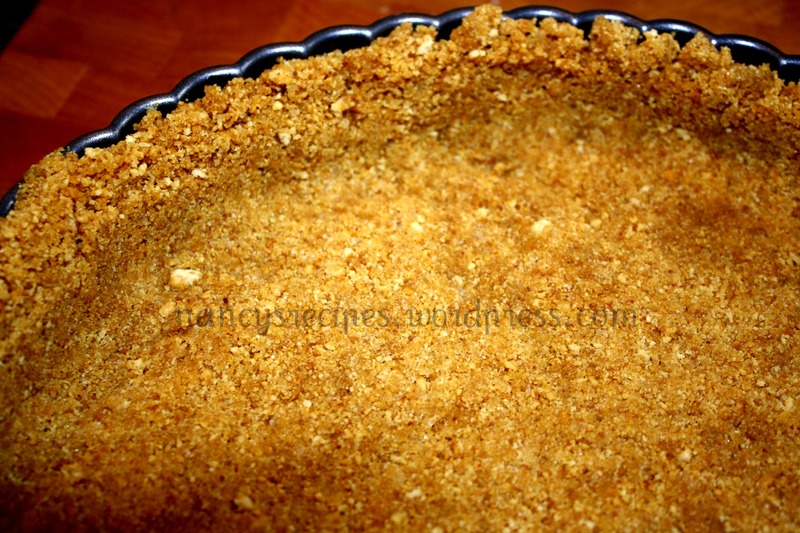 Instead of the vanilla cookie crust, I made a graham cracker crust using the box directions and I did use the amount of sugar called for on the box ~ but I used 3 very scant tablespoons. It was probably more like 1 1/2 to 2 tbsps. The rest of my changes you’ll see on the ingredient list. The recipe came from Food.com and was posted by TasteTaster. I seem to be cooking from Food.com alot lately. Heat oven to 400º. Lightly spray tart pan with removable bottom, 9×1 inch, with cooking spray. Mix crushed cookies, egg white and butter until crumbly. Press onto bottom and up the side of pan. Bake 8-10 minutes or until light golden brown; cool. Beat milk, pudding mix and lemon peel in medium bowl with electric mixer on low speed about 2 minutes or until smooth. 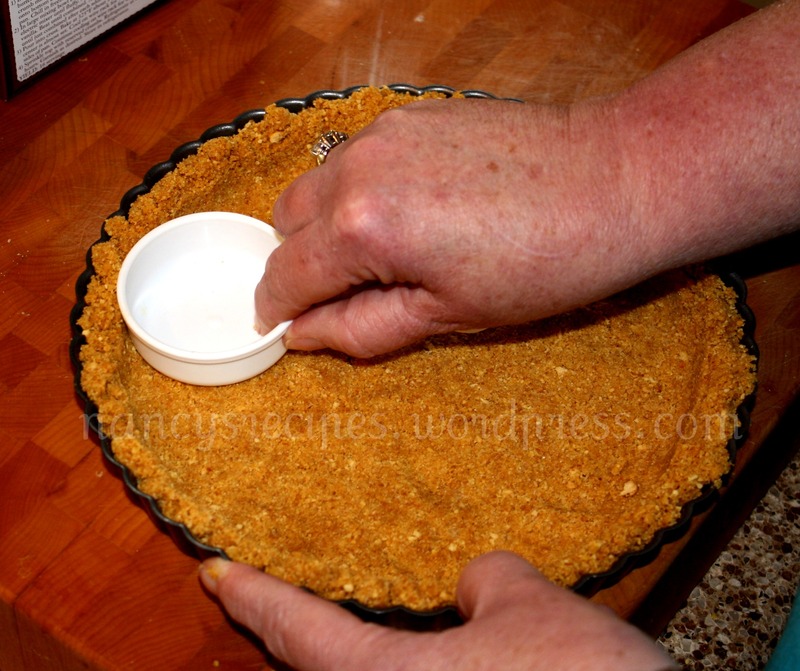 Fold in the whipped topping and spread the filling over the crust. Cover and refrigerate at least 2 hours until chilled. Mix sugar, cornstarch and water in 1-quart saucepan the stir in 1/2 cup of the blueberries. Heat to boiling then reduce heat to medium-low and cook about 5 minutes or until slightly thickened. Stir in lemon juice and remove from heat. Cool 10 minutes. Stir in remaining 1 cup blueberries and cover and refrigerate at least 1 hour until chilled. Keep tart in the refrigerator. The other day I was looking at the piles and piles of cookbooks I have laying around, pulling some out and thumbing through them. I decided that I HAVE to start cooking more from them. So, my cooking goal this year is start going through them and cooking at least one recipe from each. Some I know that I will spend more time cooking several recipes and those that I can’t find one single recipe to make, I will donate. No sense keeping a book I won’t use ~ unless it’s it’s one of my really old, antiquey ones and then I’ll keep it. I figured it will take me years to accomplish this since I will still be cooking from other sources. At last count a few years ago, I had 1200 cookbooks. I’m guessing it’s close to 1500 now but nobody tell Mr. Meat Eater, he’d have a stroke and then I’d have to point out his zillions of tools… Anyway, I’ll be blogging for years! So that’s my cooking goal for this year (and the next several years, LOL) ~ do you have any? I like the word goal better ~ resolution just sets me up for failure for some reason. Of course, I will continue with my usual goals of simplifying and reading 100 books this year. We’ll see how it goes. Something else I decided to do this year is to post only on weekdays and to give myself the weekends off. I do much of my cooking on the weekends so this way I’ll have more to post during the week! On to the recipe ~ I LOVE this recipe. 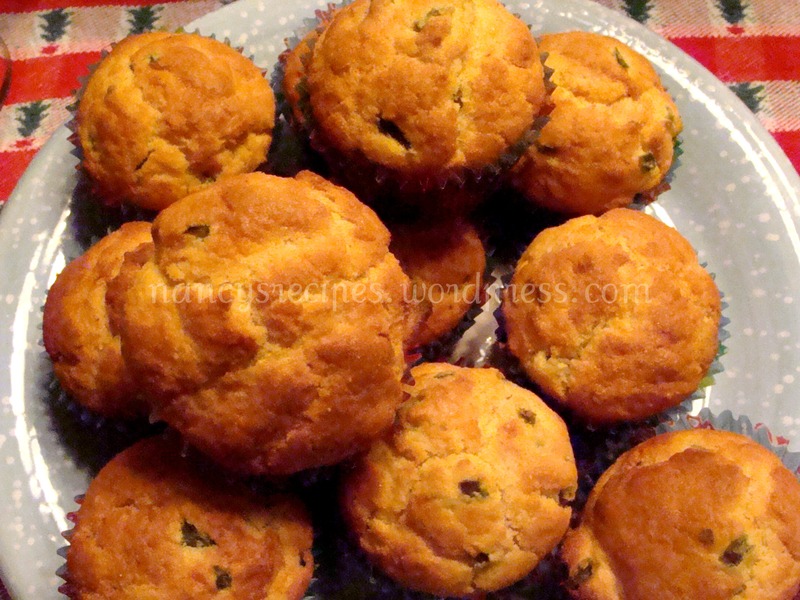 These muffins go with so many of the meals I make. They are spicy but not terribly so ~ really flavorful and they are super easy to make. 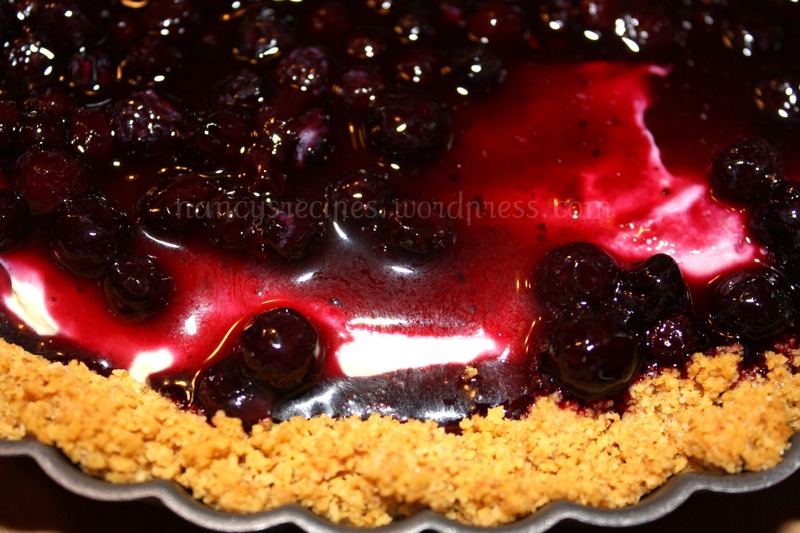 I found this recipe on Food.com posted by my friend and former fellow host French Tart. FT now longer participates on Food.com unfortunately and we miss her. Heat oven to 400º and grease a muffin tin or put cupcake liners in the pan and spray them as well. Mix all the dry ingredients together and then add the buttermilk, melted butter and the egg. Mix until all the ingredients are combined – do NOT over mix or the muffins will be tough. Add the jalapeno peppers and mix gently again. Spoon into muffin tin (I use an ice cream scoop so the muffins are roughly all the same size) and then bake for 20 to 25 minutes or until golden brown. 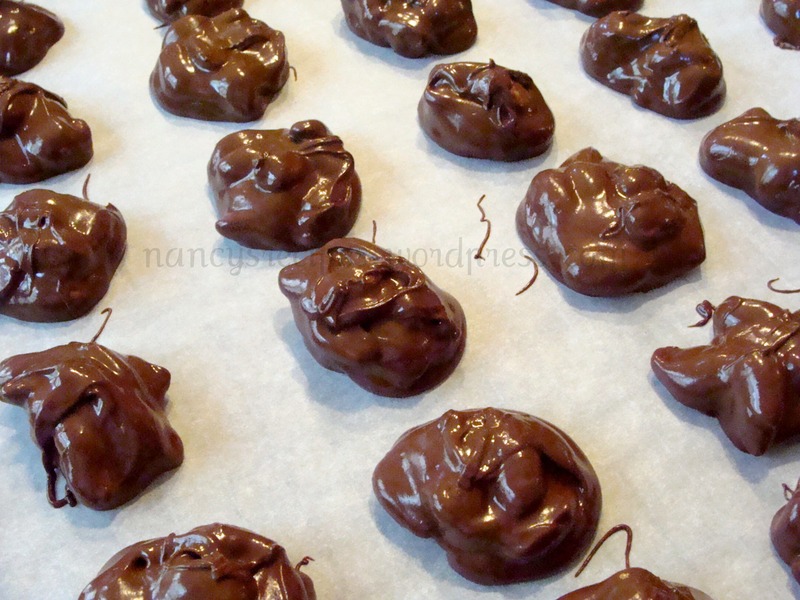 Peanuts covered in chocolate and butterscotch ~ what could be better? I found this recipe on Food.com posted by mollypie and it looked great so I decided to try it for Christmas gift giving. It is beyond EASY!!!! Now, I am NOT that big a fan of butterscotch ~ a little goes a long way as far as I am concerned but this recipe says it’s a two for one for the chocolate/butterscotch coating so I switched it up to 2 bags of chocolate chips to one bag of butterscotch instead of the other way around and it worked great. Of course you can make it whichever way you prefer. Melt the chocolate/butterscotch in a microwave safe bowl at 50% power for 30 seconds at a time until completely melted. You can also melt on the stovetop in a double boiler if you prefer. Add peanuts to the melted chips and stir until all the peanuts are coated. Drop by tablespoonfuls onto parchment paper and let cool until they harden up ~ they are not rock hard but firm and are soft to bite into. Makes about 3 dozen clusters. Mushrooms are one of my very favorite foods and I will eat them just about any way. This recipe is easy and, of course, I tweaked it some from the original. I found it on food.com posted by Dreamer in Ontario. In the picture, I have sliced them into strips and I really think it looks like meat on my plate. I served it with quinoa salad . In a food processor, grind almonds until powdered. Add the oil, soy sauce, water, vinegar, garlic, oregano and process until well blended. I used my mini chopper with no problems. 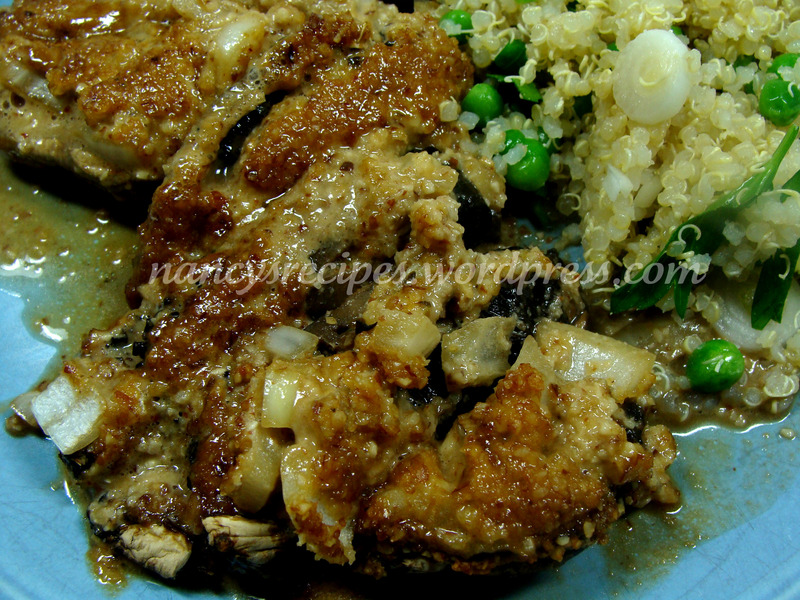 Place mushrooms in a baking pan upside down (stem side up) in one layer. Sprinkle the onions over the mushrooms and pour the sauce over the top. Bake, uncovered, for 30 to 35 minutes or until the mushrooms are tender. To serve, slice into slices ~ one mushroom per person. Well, it looks like meal planning is the most asked for feature so that’s the direction I will take. I am working on some meal planning tips, how I meal plan, etc., so look for those in the near future. I will try to incorporate some of the other things asked for as well. I also thought that I would start posting about making everyday foods like bagels, tortillas, pitas, and my success or failure at it. I am also trying to go more towards fresh foods but there are some things that I’ll never stop using so I am going to try to find healthier alternatives. I hope you all will stick with me! Any other ideas, please shoot them my way! We had a BBQ for DH’s co-workers and some family friends a couple of weekends ago and one of the salads I made was this very delicious seafood salad. Deely from Food.com (formerly Recipezaar) suggested it to me and it was a HUGE hit at the BBQ. I took her advice and used fresh shrimp and crab and I would suggest that you do the same. It’s a very easy salad to make and I know that I’ll be making it over and over. Mix seafood and lemon juice and then combine all ingredients. I made three different kinds for the bridal shower ~ ham salad, dill chicken salad, and cucumber chicken salad. All three worked well. Yes, I should have cut the crusts off the bread but I was pressed for time. I have already posted the dill chicken salad recipe here. I cut up the chicken a little smaller but otherwise made it the same way. The cucmber-chicken salad recipe is from Recipezaar and can be found here. I made up half the mixture the day before the shower. 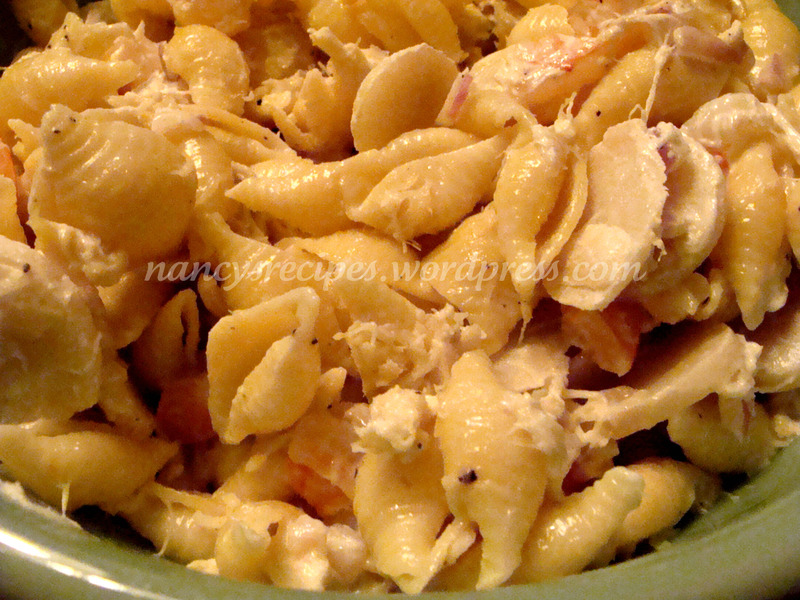 The ham salad is not really a recipe but a way to use up leftover baked ham. My Mom made it for years and I have been known just to bake a ham so that we can have the leftovers for ham salad sandwiches. Here is what I do: I slice some ham into small pieces and throw it in my mini chopper (you could use a food processor or a meat grinder) with a small piece of onion and grind it up, put it in a bowl, add a spoonful of pickle relish and some mayo and mix it up. That’s all there is to it. Just add the mayo a little at a time until you get the consistency you want. Easy peasy!